We are really enjoying our trip here in Denmark. The people are very friendly and everywhere you go you will find people speak English. 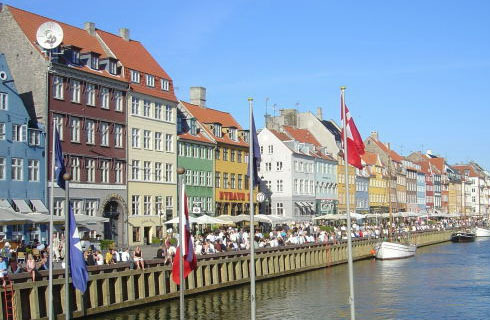 Denmark is mostly surrounded by water so it gives them some of the greatest beaches. On Sunday, we went to the West coast to a resort area called Blavand. The beach there has powder white sand and it separates the town and summer houses. There is plenty of shops and restaurants on the main drag into town and it is really busy right now as the factories in Denmark have closed for 3 weeks vacation. On Monday, we went to Legoland. 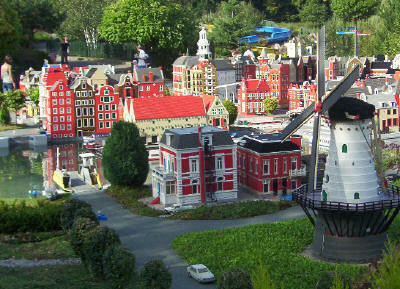 Denmark is the home of Lego and the park is right across from the Lego plant. That is probably why the store in Legoland has all the new Lego not available yet in Canada. The cost to get it was about 50.00. All the rides are based on Lego characters and everything in the park is made of Lego bricks. It is really something to see. On Tuesday, we went to the island of Romo which is attached by a causeway. 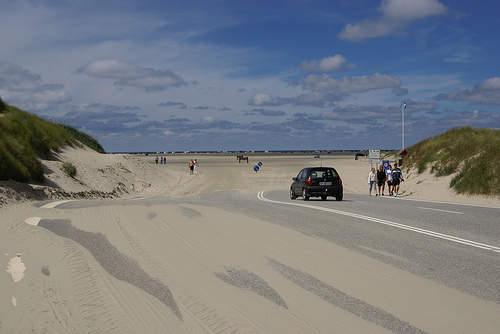 Romo has the widest beach in all of Europe and you can drive your cars onto the beach as it would be too far to walk especially if the tide is out. We stayed there for 2 days and we are now back in Kolding. We are trying to arrange a summer house in Blavand for a couple of days so I will let you know what happens there. Well we made it to Denmark. It seems funny to be travelling in Europe, all the borders seem as one as we did not have to show our passport or clear any customs. It is kind of like flying from Saskatoon to Calgary. When we checked in at the airport in Paris, the counter only opened two hours prior since Denmark is not considered an International Destination, so there is really no need to get there early. When we arrived in Copenhagen, we had to change our money from Euros to Kroners since they still have their own currency. Jorgen’s Mom met us at the airport and we picked up our car today. We are heading off to the small island of Romo on Monday for a couple of days. It will be nice to spend a couple of down days after the hectic pace of Paris. We are going to see Harry Potter tonight. We stopped by the theatre to buy our tickets and you preselect your seats so you can come any time and still get a good seat. The best part is there is beer sold right in with the snacks. Now that’s my type of movie 🙂 Talk to you soon. It has been a very busy 2 days. Monday night we went shopping on the Champs Elysees, 15 blocks of pure pleasure. This note is for the ladies, July is sale month in Paris and every store in the city has between 20% – 70% off. It’s the law! 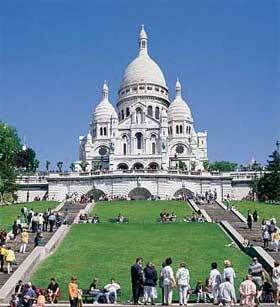 We have been to the Sacre Coeur, Notre Dame, Latin Quarter and out to Versailles today. Taking the subway in Paris takes a while to get the hang of but once you do, it is so easy to get around. We are heading to Denmark tomorrow so we will talk to you from there. We arrived yesterday after our flight on Air Canada. The flights all went very smoothly and on time. When we arrived at the Paris airport, we decided to take the train into Paris. We had bought a 5 day 6 zone pass that was good from the airport. The train station is easy to find and well marked. The ride into the city was 30 minutes. After finding our apartment and the 105 steps up we headed off to the Louvre which is 2 blocks from our apartment. 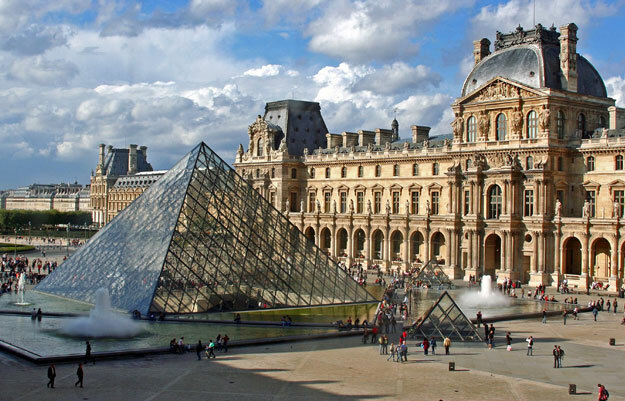 It is an amazing museum and a must for all Paris trips. The Mona Lisa is always a show stopper and still as busy as ever. Today we took the Fat Bike Day Tour of Paris. If you are not the bus type and want to try something different, this is the thing. We biked through Paris and stopped at all the main tourist attractions. Although we did not go in, your guide lets you know all about what you are seeing. It is amazing. It is nice to bike around Paris and see it from a totally different perspective. From here we are off to our boat tour on the Seine.